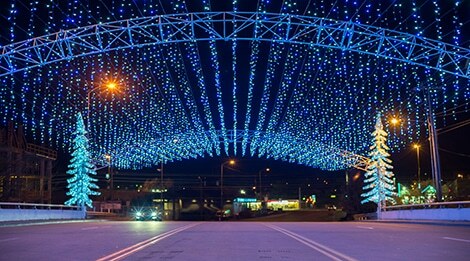 Winterfest lights in Pigeon Forge shine from November 1st through February 18th. 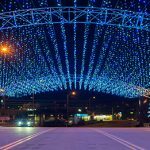 See more than 5 million shining Pigeon Forge holiday lights when you take the Winterfest Driving Tour of Lights! Along your driving tour, you’ll see bear, deer, fox and other critters native to the Smoky Mountains “wandering” through Pigeon Forge. Sparkling lights, giant ornaments, and tall, tall trees are seen on Island Drive and throughout the Island in Pigeon Forge. Even the 200-foot-tall Great Smoky Mountain Wheel shows off the holiday spirit with red, green and white lights. 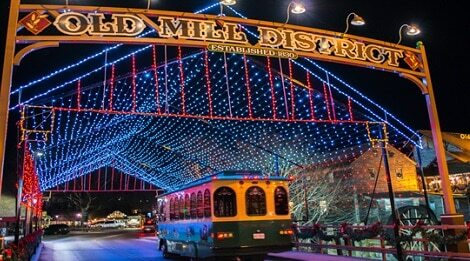 More than 4 million lights shine during Dollywood’s Smoky Mountain Christmas, when the park is filled with holiday music, plenty of rides, a nightly Parade of Lights and much more. 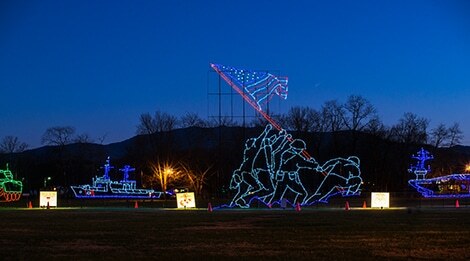 Patriot Park is home to the largest collection of Winterfest light displays, all with a distinctly Americana theme. This grouping includes the Liberty Bell, a paddlewheel-driven riverboat, the rolling waves From Sea to Shining Sea and a multi-display salute to America’s Armed Forces. Get a glimpse of some of your favorite fairytale characters lighting up the Pigeon Forge Parkway. You’ll see Mother Goose, the giant clock from Hickory Dickory Dock, the cat and fiddle of Hey Diddle Diddle fame, and Humpty Dumpty, complete with all the king’s horses and all the king’s men. Another highlight of the Winterfest Driving Tour of Lights is a 60-foot-tall tree adorned with colorful lights, ribbons and sparkling ornaments from the very bottom to the twinkling star on top. You may pick up your FREE Driving Tour of Lights brochure and map at our Pigeon Forge Welcome Centers or at the Pigeon Forge Trolley Office. You can also download the Winterfest Driving Tour here. 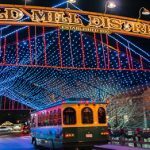 Winterfest Tour of Lights will begin November 1st. We look forward to seeing you in Pigeon Forge for Winterfest!